It’s been a while since I cooked up a pot. Mr. 12 had swimming practice that finished quite late. I figured an early departure from work would give me just the right amount of time to get a big pot of soup on the table just in time for his return. This version I found in a recipe book imaginatively titled ‘Sataa soppaa’ (100 soups) and from memory was probably one of the first finnish books that I borrowed on my then new library card! This is a real slow food type of dish. It all starts the night before when the dried peas are put to soak. 24 hours later the peas (still in their soaking water) are put to slow heat, a nice chunk of pork shoulder on the bone (repeat on the bone!) is added along with a few carrots. The above chunk was not the best cut, serves me right be being slow on the shopping. Early shoppers get the best cuts. The next part is removing the scum. Depending on the meat, it may only take a few minutes. is that scum I see? Once the scum is gone, let the soup simmer for an hour and a half. 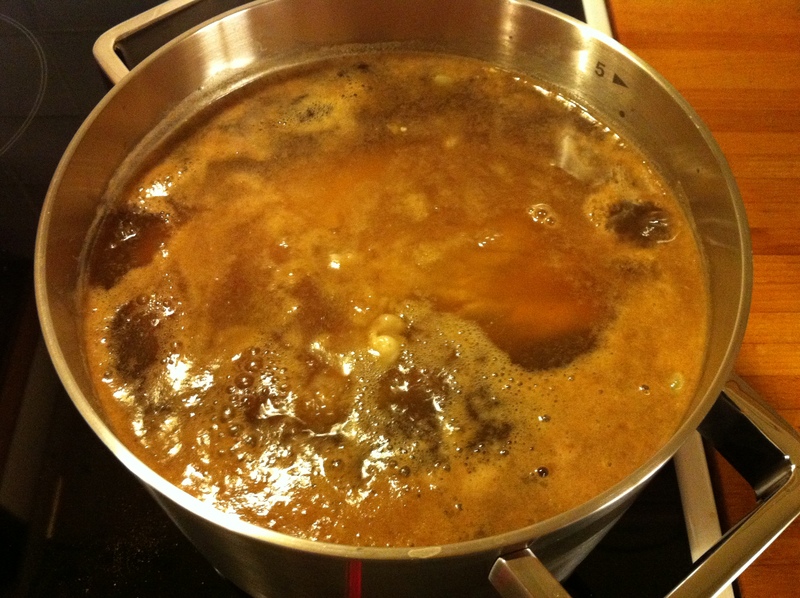 Stir occasionally and top up the liquid if the level starts falling. Sometime you can add up to an extra litre. Watch the meat and if it starts falling off the bone, it’s time to turn the heat down low. Pull the meat from the soup and shred / cut into small chunks and put the meat back to the soup. 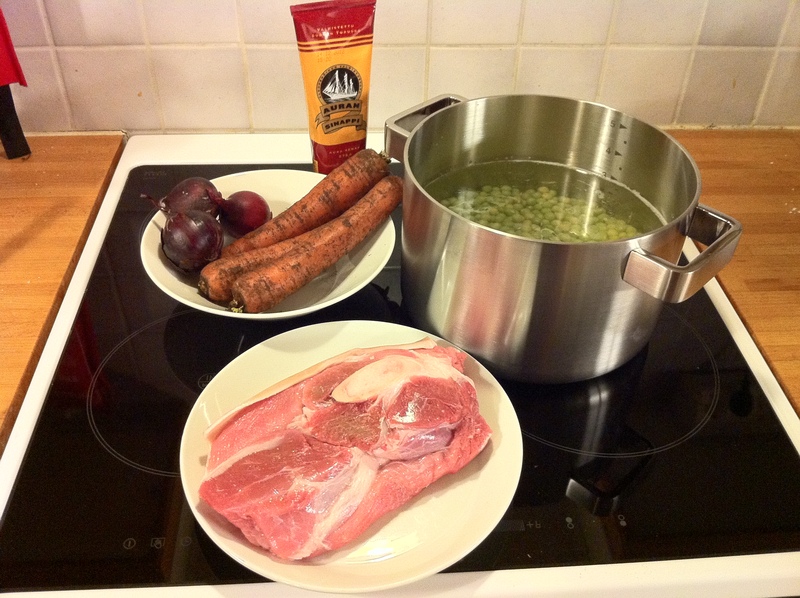 Stir slowly to mix the meat thoroughly through the soup and then you are ready to serve! Hyvää ruokahalua / bon appétit! Pea soup is a favorite of mine since childhood. This recipe looks delicious. I’m going to try it. I hope you are well and happy! Judith! I just posted the recipe (sorry it’s metric and when I tried to convert I got all sorts of weird numbers) 🙂 It’s a great winter warmer! Homemade soup from scratch is a boon for the stomach and the soul. yeah, not sure you’ve convinced me there. 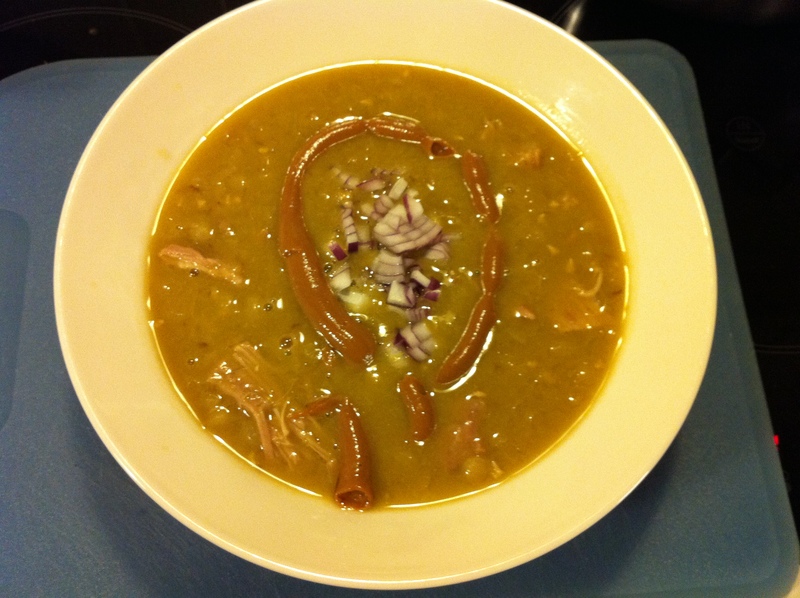 It is the spilt peas that are the problem for me…..
but have to agree with El Guapo, homemade soup is the best!